TEXT OF THE WORLD PRESS CONFERENCE OF THE ALL PROGRESSIVES CONGRESS GUBERNATORIAL CANDIDATE OF NASARAWA STATE ENGR A. A. SULE HOLDING IN LAFIA ON MONDAY 3rd DECEMBER, 2018. 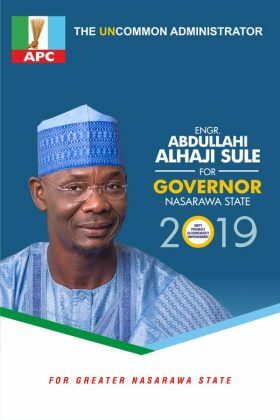 The purpose of this press Conference is to present myself as the Gubernatorial Candidate of the All Progressives Congress Party (APC) in Nasarawa State as well as to unveil my mission for a “GREATER NASARAWA STATE”, by taking it to the “NEXT LEVEL”, which is the National Slogan of our Party for the Presidential Campaign. It might interest you to know that I am a product of Roman Catholic Mission Primary School, Gudi. I went to Zang Commercial Secondary School, Bukuru; and Government Technical College Trade Centre, Kuru, from where I proceeded to Plateau State Polytechnic, Barkin-Ladi. I then went to Indiana State University, USA, for further studies. I hold a Bachelor of Science Degree in Mechanical Technology and a Master of Science Degree in Industrial Technology, both from Indiana State University, USA, and a Certificate in Information Technology from University of Houston, Texas, USA. I have had a highly successful Professional Career Spanning over 35 Years both in the Public and Private Sectors. I worked in Plateau State Electricity Corporation, as well as the Jos Steel Rolling Company, Jos. In the Private Sector, it is a common knowledge that I the Managing Director of African Petroleum (AP) Plc. I have held various Managerial positions in Dangote Conglomerate, rising through hard work, dedication and commitment to the position of Deputy Group Managing Director and later the Group Managing Director/Chief Executive Officer of Dangote Sugar Refinery Plc. Also, I had worked with Tetra Technologies, Houston, Texas, USA, as Director of Business Development and later Country Manager for Nigeria. I was also a Director of Business Development for Africa and the Middle East of Osyka Corporation, an Independent Oil and Gas Company among others. I joined partisan politics in 2000 as a card-carrying member of PDP but I resigned in 2006 to join the Advanced Congress of Democrats (ACD), and later the Action Congress (AC), on which platform I contested for the office of Governor of Nasarawa State in the 2007 elections. Following the outcome of the 2007 Governorship race in Nasarawa State, I became active in developmental politics while still in business. I have participated in various developmental projects in Nasarawa State covering construction and renovation of schools, clinics, security posts, houses of worship among others. I have also invited as well as funded visits by many investors to explore the investment opportunities that abound in Nasarawa State. Gentlemen of the Press, with this modest educational background and wide range of working experiences, I believe I have suitable credentials to steer the Leadership of the Nasarawa State come 2019. We must appreciate the developmental strides of the past Governments since the creation of Nasarawa State in 1996. The foundation laid is in no doubt formidable and I am prepared to build on this foundation for a “GREATER NASARAWA STATE”. At this juncture, permit me to appreciate in particular His Excellency, Governor Tanko Umaru Al-Makura for his modest contributions in the building of a Modern Nasarawa State. Gentlemen of the Press, my vision is anchored on Industrialization of Nasarawa State, to make it the Industrial and Economic hub of the North-Central Zone of Nigeria. We are convinced that this policy is capable of addressing the challenges of unemployment of Youth and Women, wealth creation and boosting economic activities in the State. Given my background in the Private Sector, I will leverage on my net worth of investors, local and foreign, to attract their capital for the Industrialisation of Nasarawa State. We want to appreciate the APC led Government for approving the prospecting and exploration of petroleum product in Keana Local Government of the State. Similarly, a world-renowned Agri-business company, Olam Nigeria Ltd, collaborated with the State Government to usher in Agricultural Revolution in the State this is highly commendable. We equally wish to note the partnership of the State Government with Dangote Group to establish the Integrated Sugar Refinery in Tunga area of Awe Local Government, the largest in Africa. These projects, are no doubt a Road Map for the industrialisation and economic development of the state. We will be committed to sustaining these partnerships for the benefit of the citizens of the State. Relying on our natural endowment which forms the Four Pillars of Nasarawa State i.e Land, Solid Minerals, Location and Labour, an Economic Development Plan will be established to create employment and lay the foundation for increased Internally Generated Revenue (IGR) to augment Federal allocation. We will also establish the State Development Council which will meet periodically to advice Government on topical issues of governance in the State. We will establish Small Medium Scale Enterprises (SME Ambassadors) to empower 3,000 Women, Youth and Physically challenged persons annually by identifying and attracting intervention funds to support them. The Government will partner with Foreign urban based development companies to create Industrial Zones in each of the 3 – Senatorial Districts of the State. Similarly, we will partner with both local and foreign ventures to embark on Owner-Occupier Mass Housing Schemes in each of the Senatorial District. In partnership with cooperative societies, Cottage Industries will be established under a small business assistance scheme for local communities. We will establish a Diaspora Desk in the State Capital, Lafia, to encourage Nasarawa State indigenes in Diaspora to invest in the State. The promotion of the Agricultural Value Chain in regards to many of the abundant food and cash crops that are available across the State. We will take appropriate measures to boost Agriculture through the provision of improved Technology and Agricultural Credit Financing Scheme for the benefit of rural farmers through various Agricultural Cooperative Societies. We will in partnership with private investors set up Agricultural Cottage Industries to add value to agricultural produce and thus curb post-harvest losses incurred by farmers. We will sustain access to basic agricultural implements; Fertilisers, pesticides and other inputs. Primary Education is the Foundation of every child’s development. Accordingly, we shall continue to improve on the quality of infrastructure and teaching aids. We shall use existing training institutions to train and retrain our teachers to equip them for qualitative delivery of teaching services to our pupils. We will sustain the Policy of Special Schools for the Physically challenged. While continuing to support girl child education in line with United Nations Convention. We will encourage private initiative in the education industry to augment the efforts of Government. Aware that education holds the key to the development of any society and also aware that Information Communication Technology (ICT) is a critical component of modern development; we will establish Vocational/Technical Training Centres in the 3 – Senatorial Zones with emphasis on ICT. Thus, ICT literacy will be compulsory at all levels of Secondary Education. More teachers will be re-trained to man our secondary schools with particular emphasis on science and technical education. We will continue to improve the quality of schools’ infrastructure, equipment and learning materials in the state. As part of our effort to improve on qualitative education in Nasarawa State, we will solicit the cooperation of the Federal Government to site a Federal College of Education in the State. We will establish Colleges of Engineering and Environmental Sciences in Nasarawa State University, Keffi. We will sustain the State Bursary and Scholarship Scheme and seek educational development partners to support this effort. Primary Health Care is the flagship of health care delivery. We will ensure that the foundation is built upon preventive medicine. As part of our strategy to preventive medicine, we will re-introduce Sanitary Inspectors through appropriate State legislation. We shall sustain the improvement of basic health infrastructure, manpower, training, capacity building and facilities upgrade. We will come up with deliberate policies to increase our immunisation coverage within the State and drastically cut down on infant mortality rate. Secondary Health Care Facilities will also get special attention by attracting appropriate manpower to our General Hospitals while striving to retain the current staff strength by periodically training and reviewing their welfare package. In furtherance to our aim of improving health care delivery, we intend to pay special attention to the schools of Nursing, Midwifery and Health technology to produce quality manpower for the primary health care centres. A robust revolving scheme will be put in place to enhance the provision of prescribed drugs, consumables and affordable health care facilities at all times. We will as a matter of policy establish a welfare scheme where we provide free medical services for pregnant women, children under the age of 5, indigent patients and senior citizens over the age of 65 years. We will develop mechanism to regulate the practice of patent medicine owners and encourage them to contribute positively to the healthcare delivery system of the State. We will declare a state of emergency on security by introducing a community-based security system where all will be responsible for the security of lives and property in their immediate environment. This will be aided by incentives and protection to whistle blowers and informants. The effectiveness and efficiency of the security operatives in the state will be enhanced by providing operational vehicles and additional crime fighting/communication equipment. Our Community based security system will be anchored on Civilian Vigilante security watch that will operate from the ward levels. We will introduce a “Water-For-All Scheme” where all towns and villages will not be left out in the provision of portable drinking water. A comprehensive and workable water master plan for the state will be developed and implemented in conjunction with the Federal Ministry of Water Resources. All existing water sources in major cities and towns will be expanded to take care of increased population and needs. Electricity is the backbone to all industrial development, we shall work with the DISCO’s to improve on the provision of electricity within the state. The Independent power project at Farin Ruwa will be given all necessary support and cooperation needed to actualize its full potentials in line with the current effort of the Federal Ministry of Water Resources. The Establishment of Nasarawa State Rural Electrification Agency to liaise with the Federal Government Rural Electrification Agency to enhance the provision of electricity in all rural communities. We will accord high priority to the development of basic infrastructure by adopting an integrated approach which should involve the upgrading of existing infrastructure and provision of new ones, both in the rural, suburban and urban communities. Special attention will be placed on Roads, Water, Housing, Transportation and Market Development. Urban Renewal Schemes to reduce the menace of flooding, slums as well as the enforcement of housing control laws and other regulations that will make the State attractive for everyone to live in will be pursued. Embark on the paving of intra – city roads, link roads with heavy traffic and arterial roads will be under taken in phases. We will establish Nasarawa State Border Communities Development Agency to address development issues associated with border communities. Our youth and women are the centre piece of our developmental programmes. In this regard, we will develop schemes for the creation of jobs and small-scale businesses, specially targeting the youth in government’s social, economic and educational policies for the purpose of making them become useful contributors to their communities and the State at large. Establish inter-Local Government and Ministries Games in addition to existing competitions in the State. This is to create interaction and further encourage cohesion among the people of the State. We will develop programmes to stop the widespread use of harmful drugs and other substances by the youth. To support and empower our women folk by strengthening the institutional capacity of the Ministry of Women Affairs to ensure it gives greater attention to the coordination of women development matters. Attention to professional women organisation or Cooperative Bodies in order to harness women groups in formal/informal setting for overall participation in the social, economic and political life of the State. A commitment to the needs and issues regarding widows, single parents and disadvantaged/challenged women. In recognition of the special role of our Traditional Institutions as the custodians of culture, values and customs of our people, we shall continue to uphold the relevance and dignity of our Traditional Rulers. We shall in consultation with the State House of Assembly propose appropriate legislations to accord the Traditional Rulers’ specific roles and areas of responsibilities in governance. We shall maintain open communication channels between the Government and workers. We recognise labour unions as partners in the development of our Dear State. In this direction, we shall introduce robust workers welfare scheme. We will continue to uphold the integrity of the Civil Service for the delivery of services to our people. We shall implement the Contributory Pension Scheme of PENCOM in line with Pension 2004 act and 2014 Pension reform act. In conclusion, I want to take this opportunity to express my deep appreciation to the leadership of our great party, the All Progressives Congress (APC) in Nasarawa state, the Elders of APC and the entire membership of APC in Nasarawa State for their massive support in the journey to my emergence as the APC Gubernatorial Flagbearer of Nasarawa state. I wish to also thank my Co – Contestants who have shown tremendous magnanimity after the conclusion of the primary elections. They have all shown leadership by accepting to collapse all their structures to ensure a robust campaign structure that will ensure victory of our party, the APC, come 2019 general election. We thank the Governor, H.E Umaru Tanko Almakura, for all his effort and support, and to our members in the National Assembly, State Assembly and Local Government Council Officials for their encouragement and support. We wish to appeal to all and sundry that the campaign have just began. We must work hard for the victory of APC Candidates from top to bottom – APC SAK. We are set to take Nigeria to the “NEXT LEVEL” by voting massively for Mr. President, My-humble self and all APC Candidates come 2019 general election. We wish to thank the members of the press for their support as well as our support groups, Women, Youth, People Living with disability and elders for their total support to our cause. We call on all Citizens of Nasarawa State to continue to have faith and support the Government of Nasarawa State in maintaining peace and shun all actions capable of causing violence. Our campaign will be issue based and devoid of character assassination, insults or castigation of individuals or groups. We call on all citizens to ensure that utterances are such that will foster peace and tranquillity in the state.